Our solar system — not to scale! Computer science isn’t just about writing programs. Students need to learn concepts such as computational thinking, algorithms and efficiency. Here we have provided a short unplugged activity where students will use features and yes/no questions to build a decision tree. Students are encouraged to focus on efficiency and build a tree with the shortest number of steps. The activity is based on classifying the planets, so is suitable for a computer science or a science class. There are a couple of extension options at the end for students who move through this more quickly or for those that need a challenge. This activity is best done in groups, so students can discuss which questions and what order make for the most efficient process. Working in a group encourages them to articulate their thoughts and listen to others’ views, rather than just using trial and error. Students will write an algorithm for classifying different planets. We are going to start small, with just 4 planets. 1. The 4 planets we are going to look at are: Earth, Mercury, Jupiter, Neptune. Make a table with the planets down the side and the following features across the top: rocky, gaseous, has moons, blue, brown/red, has liquid water. 2. Write yes/no in each cell. You may need to do some research to get all the answers. Table of planets and features. Write yes or no in each cell. 3. Turn this table into a decision tree, using the top row of the table as yes/no questions. For example, ‘Is the planet rocky?’, ‘Does the planet have any moons?’. You should be able to follow a path, answering the questions as you go and end up at a single planet. Try to keep the number of steps as small as possible. You may not need to use every question! We have provided an example below, using different questions (this one is about food!). 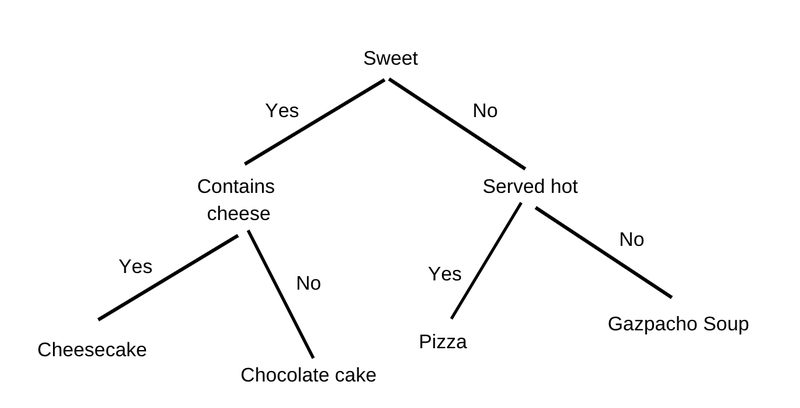 Sample decision tree — this one is sorting food. Extension 1: Can you add in the other 4 planets? You will need to come up with some extra questions to include in your decision tree. You will need to do some research to find some similarities and differences between the planets. Some suggestions to look at temperature, atmosphere, direction of rotation and size. Extension 2: Can you turn this into a computer program? You will need to use input and if/elif/else statements. You might like to work your way through the Australian Computing Academy DT 7 Python + Biology course (free for all verified teachers and Aussie students in years 3–8, accessible with an all-access subscription for everyone else) to get some tips on how to start. The above is just one example of how you can run this particular type of activity. The topic doesn’t have to be planets, it can be anything! You could even get the students to pick the topic themselves. There is a lot of scope for turning this into a longer form research project. Did you do this activity with your class? Do you have a different activity you like to run? We want to hear! Comment below or tweet us (Grok Learning) and let us know. Thanks to Jack Reichelt and Shelley Cooper-White.